Camping season is upon us, but that’s no excuse to leave your cloth diapers at home. 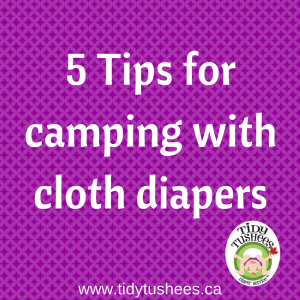 Here are some tips to successfully using cloth diapers while enjoying the outdoors. Good quality wet bag or diaper pail – We all know cloth diapers smell and when you are camping it is important to keep the smell in, and animals out. A quality wet bag will do, but a lockable diaper pail or bin is even better. Check out our selection of wetbags and diaper pails. Bio liners – These are going to make cleanup much easier when travelling. If the poop is solid it can be easily discarded so you are not carrying it around with you. We recommend Nuggles Bio Soft Liners. Pack way more than you think you need – Unless you plan on hand washing them while camping, make sure you have enough to get you through the whole trip. Swim diapers – If you are camping near water these are a must have item. So easy to use and can be used over and over on the same trip because they don’t usually get dirty and dry so quickly. You can see our selection of reusable swim diapers here. 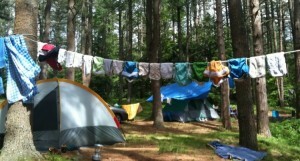 Diaper free time – Hoping to get a little potty training done while camping? Don’t worry about your little one peeing on the floor for a few days. It is a great opportunity to air out baby’s bum. Most of all,, enjoy the time with your family. Do you have any other tips for using cloth when camping? Experiences that you want to share? Let us know.